Evolution and Religion are perennially in the news, but not for the right reasons. On the one hand we have debates about creationism and intelligent design. On the other hand, we have attacks on religion by evolutionists such as Daniel Dennett in Breaking the Spell and Richard Dawkins in The God Delusion. 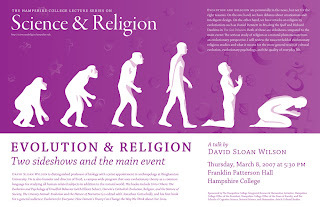 Both of these are sideshows compared to the main event: The serious study of religion as a natural phenomenon from an evolutionary perspective. I will review the nascent field of evolutionary religious studies and what it means for the more general study of cultural evolution, evolutionary psychology, and the quality of everyday life. Jared Diamond has an excellent review of David Sloan Wilson's book Darwin's Cathedral: Evolution, religion and the nature of society in the New York Review of Books titled, The Religious Success Story. For his most recent book Darwin for Everyone: How Darwin's theory can change the way we think about our lives, here is a review by Natalie Angier titled, Sociable Darwinism.